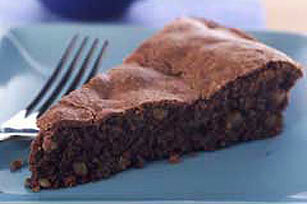 No flour power called for in this moist and rich chocolate cake. You will, however, need a bit of orange zest and some finely chopped walnuts. Beat egg whites in small bowl with mixer on high speed until foamy. Gradually beat in 1/4 cup sugar until stiff peaks form. Set aside. Beat egg yolks and remaining sugar in medium bowl with mixer on high speed until thick and lemon colored. Add butter; mix well. Blend in chocolate and zest. Stir in nuts. Gently stir in egg whites. Spread onto bottom of 9-inch springform pan sprayed with cooking spray. Bake 35 to 40 min. or until toothpick inserted in center comes out clean. Cool in pan 10 min. Run knife around rim of pan to loosen cake; remove rim. Cool cake completely on wire rack. Rich and chocolatey, this irresistible cake is sure to add the perfect touch to any special occasion. Place nuts in a food processor container; cover. Process until nuts are finely chopped, using a pulsing action. In order for the egg whites to beat up properly, you must use clean beaters and a clean bowl.